24 x 6 Stamped Steel Baseboard Return - Brass Plated Discounts Apply ! These beautiful brass grilles have constant air flow and do not have a damper attached to the cold air return. There are 2 pre-drilled screw holes on the brass grille and it comes with 2 screws making it easy to install the cold air return in your home. These brass grilles have an eye-catching brass plated finish, and are made with a strong steel core construction. The brass cold air return has a 7/8" turnback from the wall with fins spaced at 1/3" and angled downward at 20°. The brass cold air return a great addition to any decor that has brass accents. 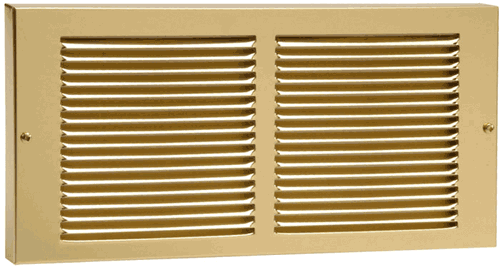 Order your brass grille based on the measurements of the vent opening you are looking to cover. Example: A 24 x 6 brass air return will fit a vent opening of 24" x 6". The outside dimensions of the faceplate will add an additional 1 ¼" each way, making the actual faceplate size 25¼" x 97¼". Need a brass grille in a different size? We also carry brass sidewall cold air returns. Accent your homes decor today with brass baseboard grilles.